The day began outside the Glen Nevis Visitor Centre at 4.30am which is located near the foot of the mountain at the start of the Ben Nevis Mountain Track (also known as The Tourist or Pony Route), which was our path to the summit. This early start followed a gentle get together the night before in a local hotel in Fort William for registration and team-bonding purposes. The hike to the summit (4,409 feet), took approximately 4 hours. The early start has been recommended to us by the local authority to avoid the crowds that usually follow later in the day. 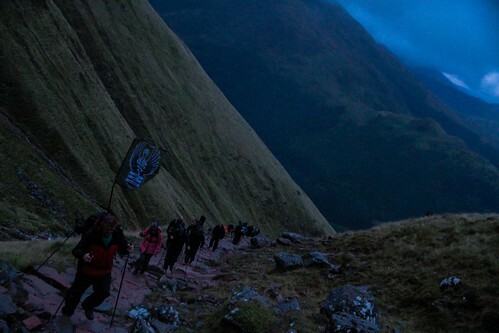 (This year’s event also coincided with the Ben Nevis Race which started at 1300 hours at which point all walkers needed to give priority of way to the runners). As a show of Love Hope Strength solidarity the team wore articles of green clothing which is our visible colour of hope and well being. Green is the colour recommended to Mike when he consulted a faith healer after his first cancer diagnosis in 1995. 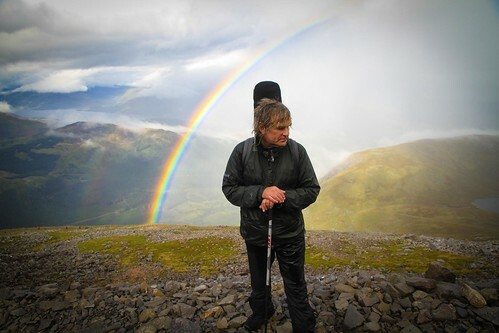 The green Love Hope Strength Flag) was carried by LHS team leader and Volunteer, Dave Spragg at the head of our walking group and the group made good progress on the ascent despite the brutal weather conditions on the summit… Mike grappled with his guitar on his back which turned into a sail! How everyone managed to stay on their feet was a miracle! Special thanks to Alarm fan and friend, Ade Parker, who transformed himself into Mike & Jules’ Sherpa as the conditions worsened towards the summit. Finally, the team made it to the top and the ruins of the old observatory building were dusted in snow! Funds generated by the LHS Trekkers participation in Ben Nevis Rocks will go towards supporting cancer care in the Highlands and the Love Hope Strength ‘Get On The List’ bone marrow donor campaign. “Copa’r Wyddfa: yr ydych chwi, yma, Yn nes at y nefoedd / The summit of Snowdon: Here you are nearer to Heaven”. Love Hope Strength Foundation as a charity promotes innovative, music related, outreach and awareness programmes for leukemia and cancer sufferers, survivors and their families. The charity raises awareness and recruits potential donors to the organ and bone marrow registers.